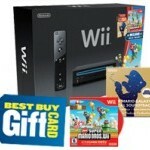 Best buy is offering a FREE $20 BestBuy Gift Card when you purchase Nintendo Wii Console w/ Super Mario Bros. Game and Music CD for $149.99. Plus you can have 5% Cash Back from ShopDiscover. 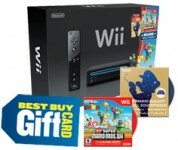 Black Nintendo Wii console, black Wii Remote Plus, black Nunchuk, 2 AA batteries, AC adapter, New Super Mario Bros. Wii game and music CD. Let you flick, swing, plunge and slash the included Wii Remote Plus and Nunchuk to intuitively control your games with sharp accuracy and modern style.